lately i have been far too exhausted to properly express my feelings here ... well in general, i guess. i am feeling, though ... believe that. what i have really been wanting to talk about is postpartum depression ... it was pretty intense this time around. rufus turned three weeks old on monday and that is when i was finally able to come up for air. im not sure im ready to dive in too deep on the topic yet because the wound is still fresh ... but soon i will. soon. life as a mother to three has been pretty wonderful for the most part. it's tough though. and im real tired. you know that point of exhaustion when your mind feels blank? that's me these days. i have so many feelings and thoughts, but there is a wall up in my head ... or so it seems. i struggle putting words together in a poetic way. i am in pure survivor mode. wake up, feed everyone, change everyone, clean the house, do the laundry, feed everyone, get everyone ready for bed, collapse ... im literally living in a haze. a sweet, delicious, stressful, hectic haze. i will miss it someday though. my mom tells me that all the time. with autumn quickly approaching and baby rufus officially a part of us, the idea of getting out and adventuring appeals to me more and more everyday. i love thinking about all the fun to be had this season as a family of five ... more apple picking, pumpkins around our house, mums on the porch, hayrides, halloween, wolfgang's birthday, jumping in piles of golden leaves in our front yard ... so many good things. 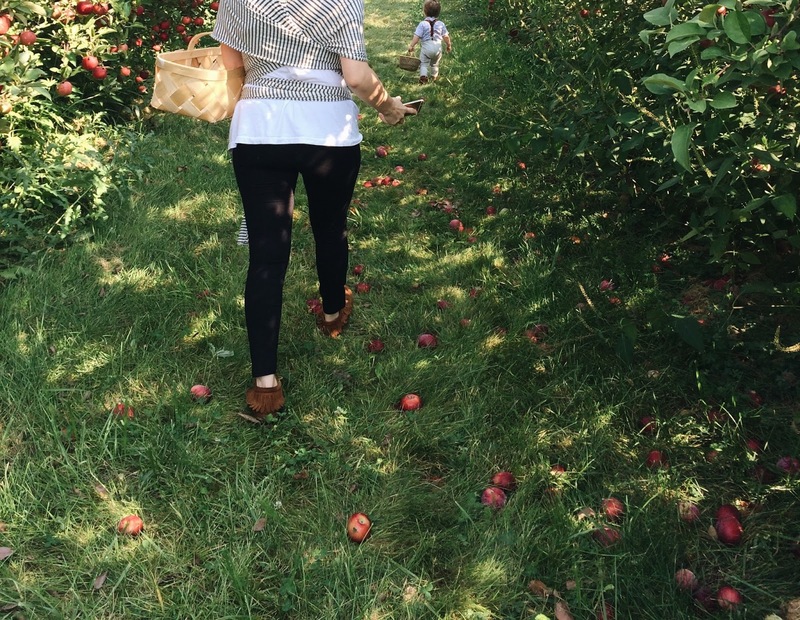 today, we met a friend at an apple orchard and had the sweetest time. eleanor couldn't go because she was in school (more about that later, too), so it was just wolfgang, rufus and i. we will certainly be going again and bringing daddy and el along. Found your blog via IG and enjoying reading your honesty and perspective on motherhood. I have 2 titles and another due in a few weeks...that haze of survival is feeling very real even now. Thanks for sharing - and beautiful photos! The one of your daughter holding Ru in the window makes me tear up. So much love!